The symphonic credentials of Elgar’s First are not immediately apparent. The work opens with an imperious largamente theme that could grace any of his orchestral works, and it is only when the sprightly second subject begins that the music displays any sense of symphonic contrast or argument. The standard approach is to not worry too much about architecture when Elgar is absorbed in his long melodies and to compensate elsewhere, especially by heightening the drama at the movement climaxes. Vasily Petrenko takes a different approach. Everything in this new recording with the Liverpool Philharmonic works on a symphonic level. The opening theme is taken at a surprisingly slow pace, creating a mood of serenity rather than grandeur. And when the second subject begins, it is not with a sudden jolt so much as a gentle nudge towards the new tempo. Yet within each of these sections, the tempos are finely judged. Petrenko’s rubato is slight but continuously applied, so the main theme breathes, and the second subject, although introduced without ceremony, soon builds up the appropriate sense of drama. That emphasis on coherency can go too far, and valuable contrasts are often glossed over. There is also a sense of spontaneity in the finest recordings of Elgar’s symphonies which is rarely apparent here. Petrenko is more daring in the development section of the first movement, on several occasions bringing the tempos right down, even as the textures build. In doing so, he is able to bring out details that are usually lost, but often at the cost of the music’s momentum and drive. On the other hand, the symphonic weight of the musical argument is often carried by the bass end of the orchestra: When Elgar repeats phrase endings, each time an octave lower, into the bottom end of the string section, Petrenko ensures that we hear every note of the double basses—for a few moments each time we are in the world of his Shostakovich cycle, before an incoming woodwind melody returns us to Elgar. The inner movements are also taken at slower than usual tempos. The second is more a stately march than a driving scherzo, making the transition into the Adagio all the more smooth. This movement too feels slow, although perhaps more for the gently contoured melodies than for the actual tempo choices. The finale is more dramatic, and builds to an appropriately grand conclusion. But even here, Petrenko focuses on instrumental detail over orchestral weight, the contribution of the piccolo one of the many aspects of this movement I hadn’t previously heard. 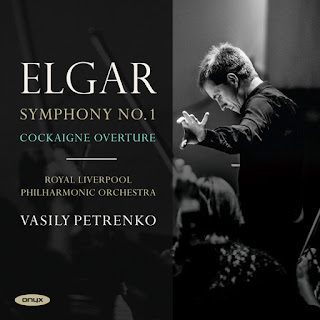 The disc opens with Elgar’s Cockaigne Overture, which provides another demonstration of Petrenko’s skilful tempo manipulation. Here he can’t avoid immediate changes of mood and texture, as Elgar imposes one melody after another, with clear contrasts between each. But again, Petrenko finds ways of maintaining continuity, sometimes seemingly by sleight of hand, raising the tempo at points where it will be noticed least. It’s all very clever, but is it necessary? The symphony too raises the question. Many of Petrenko’s predecessors have demonstrated that the work holds together fine with angular tempo changes between sections and with the developmental drama played out on a more modest scale. But Petrenko always hears this music in broader terms. Since this disc was released, an Elgar Second has been released on the same label (ONYX 4165). Given the grander scale of that music, it may prove a better fit for Petrenko’s approach.